A Separation leads you to suspect that everyone's stories are confused by hopes and fears, whether conscious or not. "The work is taking care of my father, making sure he gets his medications on time, keeping him away from the stove, keeping him from leaving the house. Can you make it by eight?" As Nader (Peyman Moadi) lays out what he expects of his new employee, Razieh (Sareh Bayat), she nods. The job sounds simple enough. But Razieh doesn’t anticipate the complications of dealing with the old man (Ali-Asghar Shahbazi), who has Alzheimer's, namely, that she'll have to clean him when he soils himself. For this devoutly religious young mother, it's a sin to see him unclothed. As she faces this dilemma on her first day, you become aware that Razieh is already bending the rules by taking the job without telling her jittery, unemployed husband Hodjat (Shahab Hosseini). Observed by her young daughter Somayeh (Kimia Hosseini) -- who points out the old man's wet pants with a child's hyper-attention to such details -- Razieh tries to avert her own eyes as she hands him a towel and shuts the bathroom door. But she sees too what the job entails, that it's not nearly as simple as Nader implied. And so she seeks options: she calls Nader's estranged wife, Simin (Leila Hatami), currently moved back to her parents' home and unable to come help, as she has class until noon. And then she calls a mosque: "I have a religious question," she begins. If she changes a senile man's pants, she asks, "Will it count as a sin?" At once mundane and profound, Razieh's question is one point of departure for A Separation (Jodaeiye Nader az Simin), which examines the many separations that shape life for two couples in contemporary Iran. Opening on 30 December at Film Forum in New York, Asghar Farhadi's movie focuses on middle-class couple Nader and Simin -- and their 11-year-old daughter, Termeh (Sarina Farhadi) -- following the first, practical effects of their own breakup. The couple is introduced in a divorce court, literally viewed from the judge's static perspective as they plead their different cases. Having obtained permission to move her family to the US (apparently with Nader's assent), Simin now faces an unexpected impediment, that is, Nader's decision not to go, at least in part because he feels obligated to look after his father (along with resenting his wife's evolving sense of freedom). It's especially striking that Nader breaks down and cries while washing his now debilitated father: you might imagine that years ago, the older man modeled proper masculine authority for his son. As this once presumed authority gives way to vulnerability and disorder, the son confronts a series of breakdowns -- social, moral, and political -- all embodied in the collapsing figure of his father. For a moment, Nader might believe his life is reordered when the divorce is denied. But he soon finds that nothing can be as he once thought it was: Simin moves out of their home and back with her parents, which means he must hire Razieh to stay with his father while he works at a bank. This brings into play another layer of separation, with the tension in Razieh and Hodjat's working-class marriage. As hard as she tries support the family while maintaining something like a traditional structure within their marriage, he resists, frustrated by his own lack of opportunities. While her job leads to conflict at home, the most sensational eruption occurs at Nader's home, when he discovers she's left his father tied to the bed during one afternoon, accuses her of stealing money, and then pushes her into the hallway. This emotional, physical fight leads to other, multilayered fights, when Razieh miscarries and her husband blames Nader. Now the onerous Iranian legal system reenters the plot, exacerbating the distinctions between classes and between genders, and, as the two daughters are questioned concerning what happened, between generations. The girls -- who become friendly during a few afternoons when they're left to amuse one another while Razieh tries to keep order in Nader's home -- have different memories of different events, but their stories tend to contradict those of the adults on both key and subtle points. While a few questioners seize on these discrepancies as signs that someone else has lied, A Separation doesn’t necessarily lead you to these same conclusions. Rather, you come to suspect that everyone's stories are confused by hopes and fears, whether conscious or not. As frequently or as covertly as the parents express their desires, the children have their own, less well-formed or strategic, perhaps, but also willful, born of feelings of powerlessness and purpose. 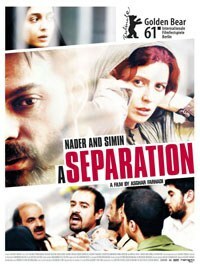 When word gets out that her father is accused of manslaughter, Termeh finds herself a victim of rumors at school; her mother blames Nader for not making a settlement with the other couple, seeing the result as proof that she was right to want to leave Tehran. At the same time, as Razieh comes to recognize that her (and her daughter's) options are limited, she's yet afraid to imagine an alternative: her faith, so demanding, also offers structure in a chaotic relationship with Hodjat. Her sense of confinement is made dramatically visible in her home, when a group of men arrive to ordain a settlement, dependent on her swearing to her story. Afraid and alone -- even surrounded by members of her community and her husband -- she retreats into her kitchen, caught inside segmented walls and obfuscating windows, afraid as Hodiat enters, insisting that she agree to -- to retell -- the story he needs to believe. This scene, as their bodies are suddenly too close and also at odds, is echoed and reversed in the film's final scene. Here Simin and Nader await yet another legal decision while seated on opposite sides of a hallway at the courthouse. As other individuals pass by, making their ways up and down the hallway, husband and wife do their best not to look at one another. Positioned against walls that push them together and expose their distance, they're unable to discover a truth to bind them.